Every month I short list products that I’ve either discovered that month, or decided that I value but haven’t discussed on my blog. A few of these are older discoveries, but I hope that some of you will check them out and give them a shot! I only have one beauty favorite this month, but I’m hoping to have many more in April! I commute into NYC from NJ daily, so I found that I need to have durable headphones. I discovered Yurbuds last year when I was getting more into working out, and fell in love. 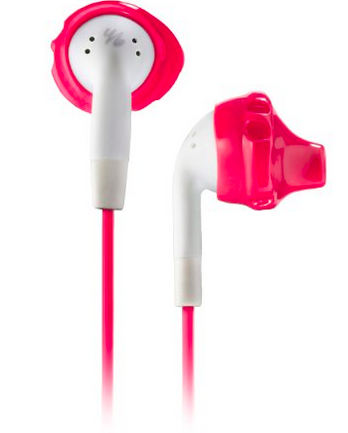 They have a line designed to fit in women’s ears, and I find the sound quality impeccable. When I put the iPhone earbuds back in my ears I can’t believe how different the quality really is. I tried to just use my Yurbuds at the gym, but now I use them everywhere! The only downside for me is that they were designed not to tangle, but they tangle SO BAD. Its frustrating, but I wouldn’t trade them in for anything. I even have a pair of the FRENDS headphones (the white and gold ones to match my iPhone) but they are static-y and not nearly as great as Yurbuds. Mine are in the pink color, but they have other options! I’ve been trying to increase my water intake, and bringing a bottle of Poland Spring to work just wasn’t cutting it. 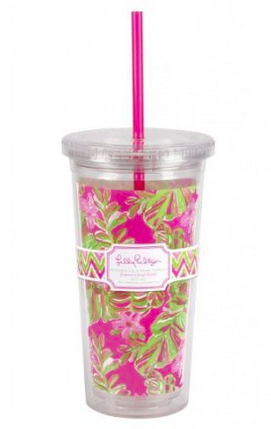 Since I am a huge fan of Lily Pulitzer I noticed that the brand makes a tumbler with a straw, perfect to keep on a desk. I picked up one on Amazon (it was a little more money because I wanted an older pattern) but it is really helping me take in more fluids and try to hit my goals. Plus it is adorable! Since I was little I’ve been a planner nerd. Seriously – it was bad. I loved decorating my planners in elementary, high school, college and even into grad school. So it is no surprise that I’m still, indeed, in love with planning. My daily planners graduated from the Moleskine (which I still use at work as my planner) to the Erin Condren, and now to my absolute favorite of them all: the Louis Vuitton PM Agenda. I can do a separate post on EC vs. LV, but for now, I’ll just say that I adore both, but didn’t realize how much I prioritize portability. I purchased a pre-loved one on Poshmark, and saved substantially. It even came with some old inserts that included the stickers, maps and address books! (All inserts need to be purchased separately from the planner when bought new). Mine is a dark purple/red vernis and I use the 2015 filofax inserts. I also bought a fisher space pen to fit in the itty bitty pen loop. 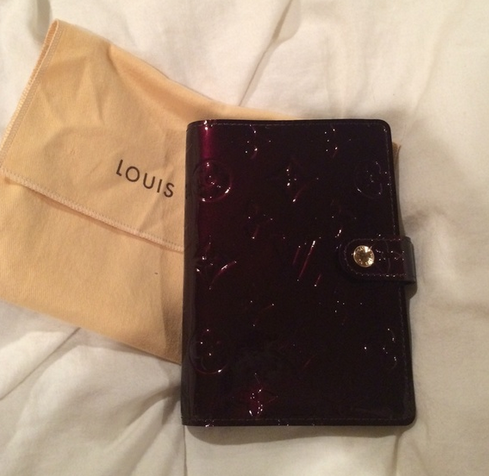 So much love for the LV PM Agenda. I typically shy away from any type of shampoo that is drugstore brand, because I’m afraid it will be bad for my hair. 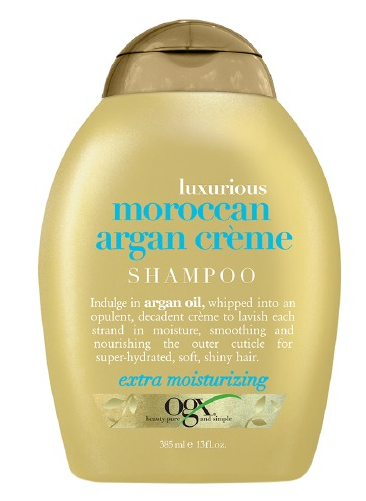 But I found OGX’s Moroccan Argan Creme Shampoo and can’t believe how soft and shiny my hair is. Major win. Last this month, I rediscovered a lip gloss that I purchased a month or two ago, but put in my drawer and didn’t give it a fair shot. 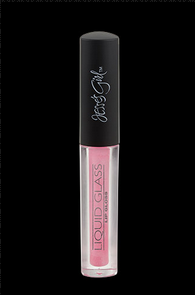 Jesse’s Girl Liquid Glass Lip Gloss in Lip Lock is the perfect frosty pink, and I’m totally digging it for spring. I’ve heard fantastic things about their eye liner and hope to pick it up soon. In the meantime, some RiteAids carry the brand, but typically just the eye shadows and lip glass. Let me know if any of you have tried these products, and what products I should try next!